Today, I’d like to introduce you to Liz, who has joined the 40+style team as editor. 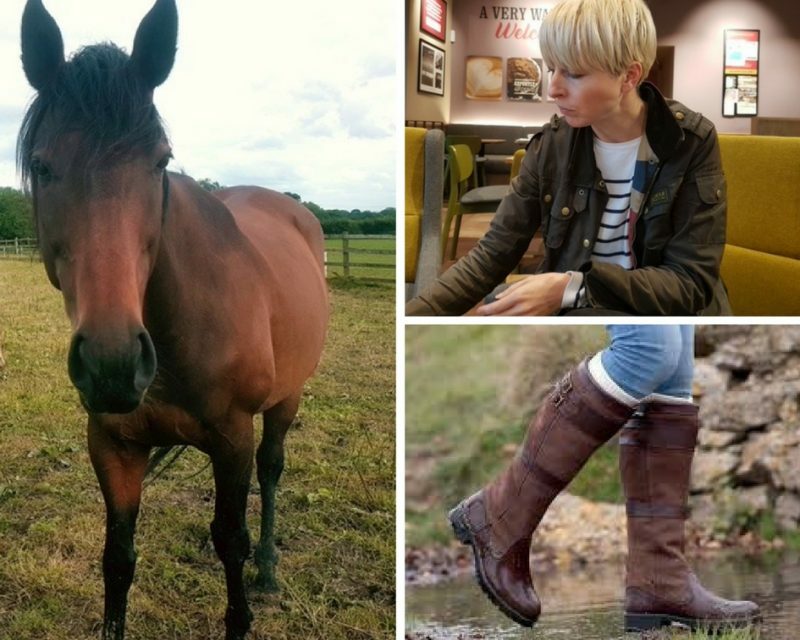 She is a fashion journalist and stylist who splits her time between writing, doing the school run, and horse riding. This is a chance to get to know her a little better. Can you tell us a little bit more about yourself? I’m originally from North East England (the part where we say ‘bath’ and not ‘barth’), though lived in London for a while to do my journalism degree and work on the Evening Standard newspaper. I’m now living in Singapore with my husband and two kids. A journalist by trade, I’d always loved literature and writing from being tiny (though at one point I thought I’d be a vet). I soon got to combine my passion for style with writing when I became responsible for the fashion pages at a regional newspaper. That’s not to say I haven’t done my fair share of news writing too. I’ve covered everything from murderers on the run to general elections, from the tragic to the heartwarming. I’m 41 and thrilled to be starting on my journey further into my 40s with the 40+ community. I like to keep things simple, but then add a twist. So, I pretty much live in skinny jeans, in black or white, but I might throw on a pair of bright orange heels with them. I also have a lot of jumpsuits. After all, it’s an outfit all-in-one. You don’t have to worry about what top goes with what bottom. They can be dressed up with jewelry and heels and I’ll often wear a jumpsuit rather than a formal gown for black tie events. Or with a blazer for work, or sneakers for the weekend! 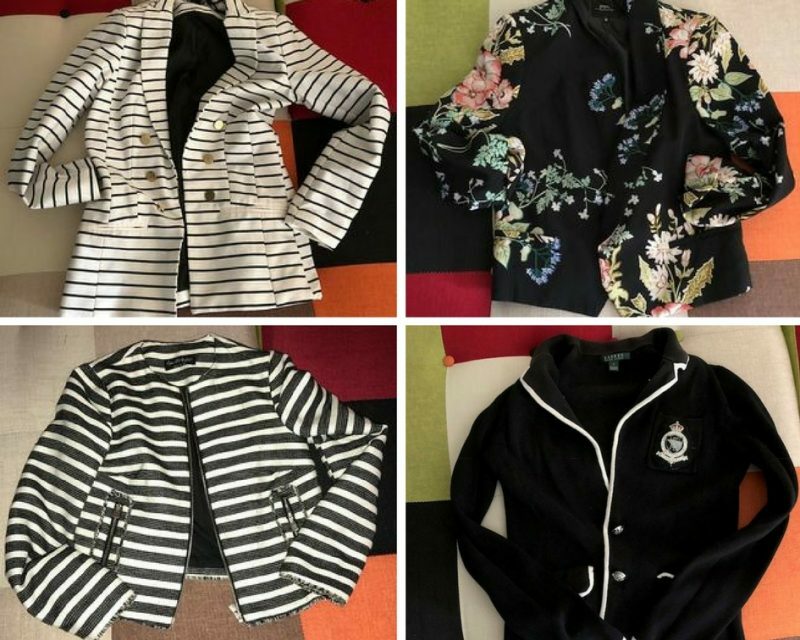 I’m not a big pattern person, but I’ve found stripes go with my #rectangle shape and I have a lot in my wardrobe. We’ve just moved from the UK, where I was always cold from around about September to April, and would wear long thermal layers under everything. I have horses so would mostly be found in a Barbour jacket (I have one scruffy one and one smart-ish one), jeans and Dubarry boots, Hunter wellies or Brogini boots. Moving to Singapore has meant no more jackets, and digging out my summer clothes from the back of the wardrobe. But, I am finding I’m not keen on some of the dresses I have in man-made fabrics as they’re uncomfortable in the heat and I need more flat shoes. So, a wardrobe refresh is needed! Jumpsuits, stripes, skinny jeans, colorful shoes, and classic colors like reds and navy. A splash of red lipstick for a night out. My hair has gradually got shorter and lighter, and has become my signature style as part of my overall look. I just wear whatever I fancy that day, no matter what I’m doing. I simply dress it up or down with accessories. So, if I want to wear a dress for the school run, I’ll team it with sneakers or sandals rather than heels. Or if I want to wear a jumpsuit for a night out, I’ll dress it up with heels and a statement necklace. I’ve got better at dressing my body type as I’ve got older. I’m a classic #rectangle so those curves that I longed for in high school never did materialize! But, as you get older, I think you stop worrying so much about what shape your body is and concentrate on keeping it fit and healthy. I don’t tend to worry about color profiling per se, but I do wear colors that I think suit me best. Pastels tend to wash me out, so I opt for a lot of navy, white, red, gray and black. I like a classic color palette. A LBD with a touch of red lipstick will never go out of style! What is your current body type and height and what are your best tips for dressing for these? I’m a skinny #rectangle and I’m around 5’6”. My style has evolved over the years and I’ve realized anything which is too fussy just drowns me and it looks as if my clothes are wearing me rather than the other way around. I go one of two ways for my figure. The first is to create some curves. So, I’ve got cocktail dresses which have pockets on the hips, shirts and dresses which have ruffles at the bust and wide-legged trousers – all of which help to create some shape where there isn’t any! The second is to play up my lack of curves and to go for long, lean shapes. So, I might opt for a 60s-style dress, or a boyish blazer and skinny jeans. I’m discovering new favorites all the time! I like smaller, quirkier labels where you probably won’t run into someone else wearing the same outfit. Current favorites are the LA label Evident for their fabulous striped dresses and crop jeans, Erin Fetherston for shift dresses, Equipment for silk shirts, Elliatt for shirt dresses, Finders Keepers for relaxed jumpsuits, and BCBGeneration for wide-legged trousers. Having said that, I’m still a big fan of the high street, and love H&M, Zara, New Look and Topshop. I’ll buy something because I like it, not because of what it says on the label. 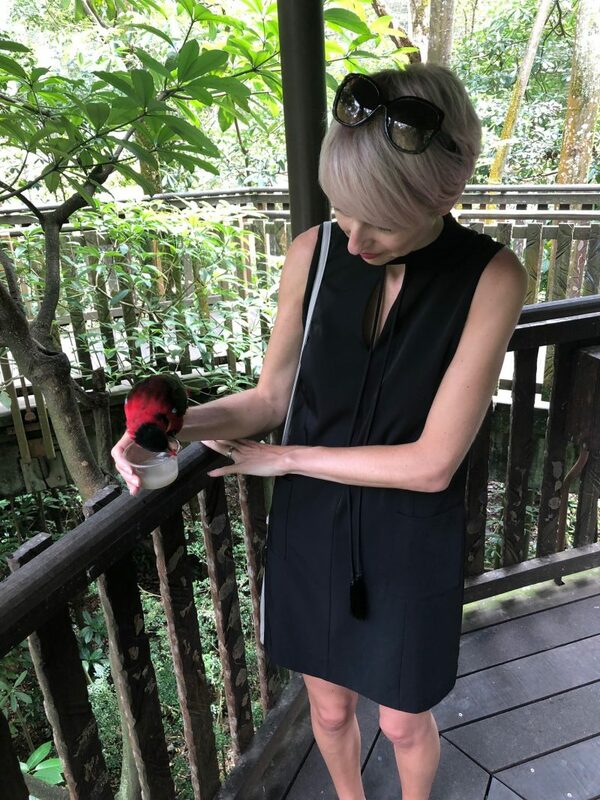 I even wore a $50 dress from H&M for my wedding in Vegas because I loved it much more than expensive options I’d seen, and thought it was perfect to get married in a relaxed way while on holiday with our kids. I teamed it with a pair of Gina sandals I bought for £60 at a dress agency in Knightsbridge during my student days. I knew I’d get a chance to wear them sometime! 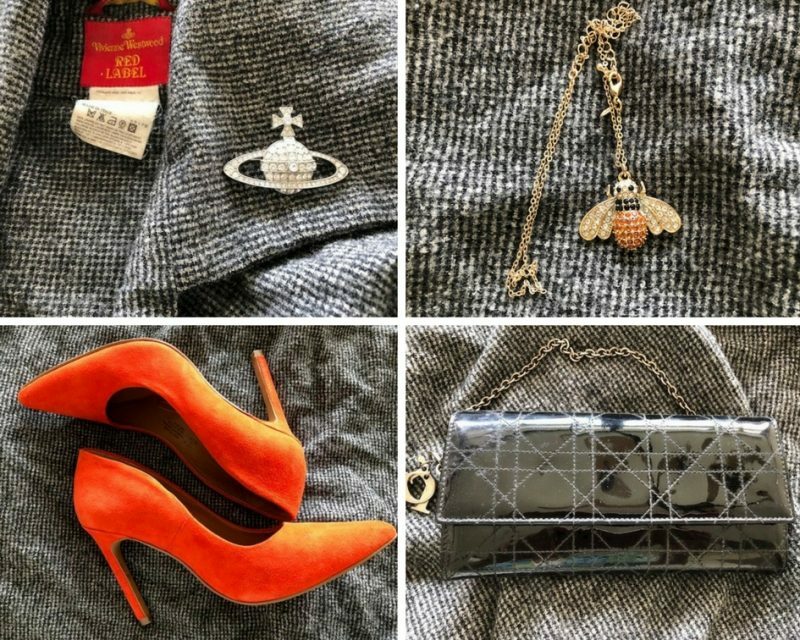 I tend only to wear one or two pieces of jewelry, but my favorite piece which I use to pin together my Vivienne Westwood wrap is a Vivienne Westwood orb brooch. I also love H&M for bright-colored shoes, and I got a Gucci-esque necklace for a few dollars from Avon! I wouldn’t say it’s changed as much as evolved. Turning 40 has made me evaluate what suits me and what doesn’t. It’s also made me more determined to stay relevant as far as style is concerned. No one should ever tell you what to wear, or that something is not ‘appropriate’ for your age. If what you’re wearing makes you feel good about yourself, then go for it. That said, I do believe in dressing classily. If I want to wear a short skirt, then I’ll go for it. But I will cover up more on top. Or, if I want to wear a bikini, I will, but I’ll take a cover-up with me in case we have lunch at the beach. More than ever! It’s not always easy to feel confident when you spot those signs of aging in the mirror. But taking the time and effort with my style helps me to feel a hell of a lot better about myself when I walk out of the door! I think what you wear becomes an extension of your personality. If you feel good about what you’re wearing and the way you look, then you’re ready to face whatever the day throws at you. It’s a fact of life that we live in an image-obsessed society and looking and dressing the part can earn you respect whether you’re heading to a business meeting or a plush restaurant. What is your beauty routine and what are your favorite beauty products? It’s pretty simple, but I’m trying to be much better than I was in my 20s when I’d end up falling into bed in my makeup! I wash with an oil-based cleanser which gets my mascara off and then use an under-eye cream, serum and either day cream (with an SPF) or night cream. I use No7 Melting Gel Cleanser, followed by the Advanced Génifique products from Lancome. I’m obsessed with Thierry Mugler perfumes and have to have the latest one when there’s a new release. I’m currently using Aura. 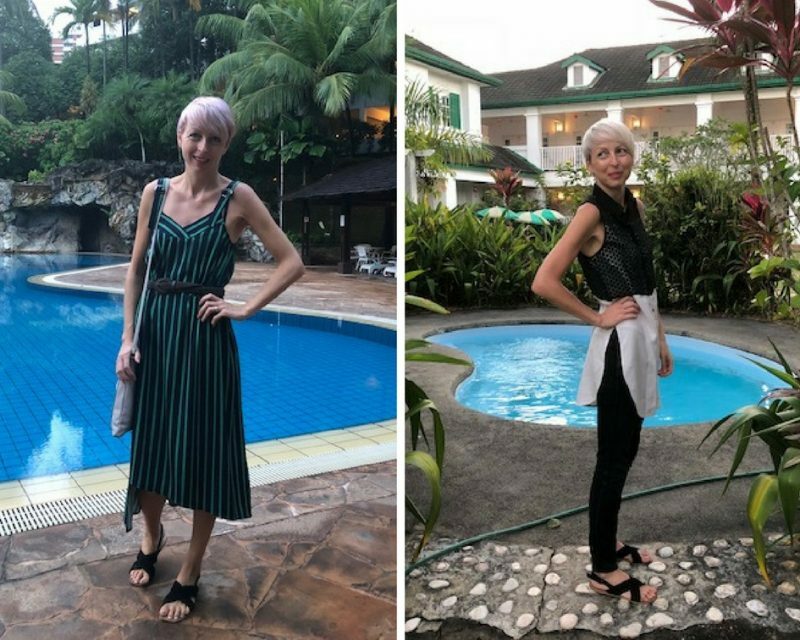 Knowing what’s on-trend does help me to evaluate my existing wardrobe though, and to maybe start wearing something again, but in a different way. While I was a high heels girl through and through, I’m walking a lot more in Singapore so am wearing more flats. I want to add more sneakers into my wardrobe this season, and will be looking for a flamboyant embroidered pair to go for the current “more is more” shoe trend. I loved the trend for double-breasted suits on the AW18 runways, and will be incorporating this into my summer wardrobe by bringing my striped H&M blazer from the back of the wardrobe to wear with jeans. I’ve got about half a dozen blazers as I think they’re the most useful addition to any wardrobe. You can add them to jeans and instantly look more put together! It’s not about being prescriptive about what you must wear or what you must not wear. I think we see enough of that online and in glossy mags, where women are placed on “worst-dressed” lists, or body-shamed while they’re just trying to enjoy some family time on the beach. We don’t need anyone else telling us what we should wear! It’s more about giving women useful tools so they can find their own style. So, this is what is on-trend, but here are the tools and techniques so you can find a way to make it work for you. Or this could be a way to adapt a trend you want to wear so that it works with your bodyshape. And, if you want to ignore a trend completely. Well, that’s more than okay. It’s about developing a signature style that is an extension of your personality and which helps you to feel like a more confident, stylish version of you! What are your plans 40+Style? The Greek philosopher Heraclitus had it right when he said the only thing that is constant is change. And, that’s nowhere more true than in the fashion industry. I’ll be helping to bring all of the latest trends to 40+ as well as tips on how to wear them. While it’s fantastic to see the models walking the runway, nothing is more inspirational than seeing how real women choose to interpret those trends. So, we’ll also be bringing you more style interviews and fantastic shoppable ideas. But, don’t be shy! If there’s anything you want to see more of on 40+ style or a particular topic you’d like us to cover, just let me know!! Just that I’m so happy to have become a part of the 40+ community! I feel so welcome already and am thrilled to be starting my journey through my 40s and beyond with so many supportive, and stylish women! Liz looks like a terrific addition to the team of 40+Style. Great style. I thought the wedding picture was very endearing. Who would have thought you could look so good as a bride in H&M. One question: what happened to the horses? Did you ship them to Singapore? If so, can they manage the heat? 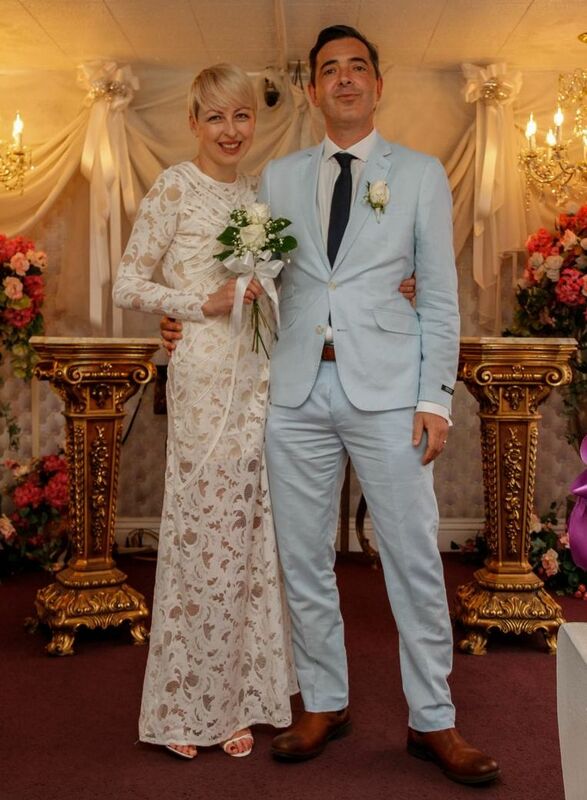 Hi Greetje – thank you, I loved my high street wedding dress! Our horses are still in the UK. I did look into bringing them, but it was just too expensive, so they’re being looked after and ridden by a good friend and her daughter. I’m missing them lots, but they send me photos and videos. Nice to learn all about you, Liz. Looking forward to your comments and thoughts. Thanks Elle – I’m thrilled to be part of the 40+Style community and looking forward to getting to know everyone! Previous post: What to pack for a ski holiday!